MONTREAL – There's been a lot of negative history brought up about the Sabres recently. A win tonight in Bell Centre against the Montreal Canadiens could give the Blue and Gold a rare dose of historic goodwill. The Sabres have won all three previous matchups this season, but they were all completed by Thanksgiving weekend as Buffalo was headed to No. 1 overall in the NHL standings. A win tonight would give the Sabres just their second season sweep of Montreal in their history, joining the 8-0 mark Buffalo rang up on the Habs in 1983-84. The Sabres have also gone without a regulation loss to Montreal in 1974-75 (4-0-1), 1994-95 (2-0-2) and 1996-97 (3-0-2). The Sabres have not won four in a row against Montreal since taking six straight from Jan. 18, 2011-Jan. 31, 2012. Faceoff is 7:15 on MSG and WGR Radio. 1. Long time, no see: The Sabres trailed in the third period of all three previous meetings and won them all. They took the two games in Buffalo by scores of 4-3 (Oct. 25) and Nov. 23 (3-2), and posted a 6-5 overtime win here on Nov. 8 on a Rasmus Ristolainen slapshot. That was the first victory in the team's 10-game winning streak. 2. The Habs' situation: Montreal is presently sitting in the second Eastern Conference wild-card slot, one point ahead of idle Columbus and two behind Carolina, which is hosting Minnesota. The building features a rollicking atmosphere in November. In late March with a playoff race in full gear, it should be wild. "I think it's great. Any time you get to play an Original Six team on a Saturday night, it's a great challenge," said Sabres coach Phil Housley. "Just where we're at right now as a group, it's something to build on and we've had pretty good success against this team this season. We were a smart team. We managed the puck well. We tried to take away their speed because they have an excellent transition game." Pominville's future is uncertain but he's stoked to get one more chance to play in his hometown. He said his usual corp of around three dozen friends and family will be in the house. 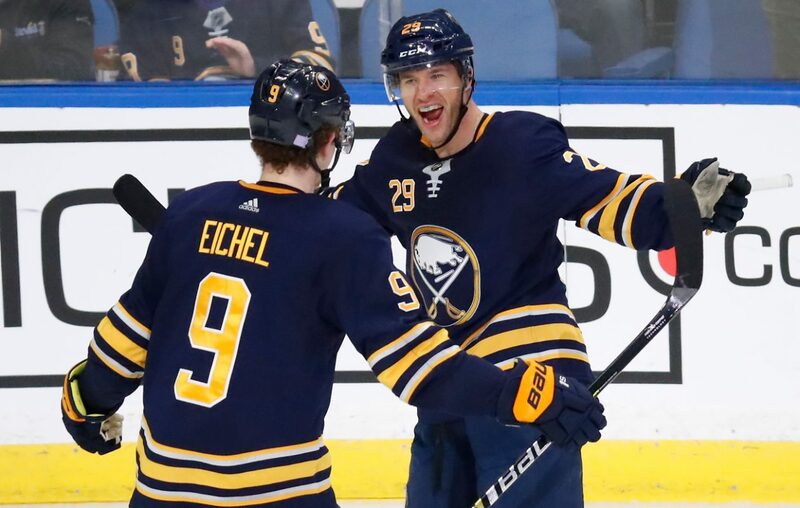 "I just try to enjoy the moment, go with it, go day by day," Pominville said today as he conducted interviews in both English and French, like he always does when he visits. "But when I saw my name (on the forward lines), I was definitely happy. I knew we were coming here. You see Montreal coming up and you're thinking it would be nice to have a chance to play there for sure. I was pretty excited to see I was in the lineup." 4. Sabres not taking to the road: The Sabres are just 11-20-5 away from KeyBank Center this season and have lost 10 straight, going 0-8-2 since their 5-4 win Jan. 29 in Columbus. The only NHL teams doing worse on the road are East sadsacks Ottawa (9-27-2) and New Jersey (10-25-3). Montreal, meanwhile, is 21-12-4 at home. 5. By the numbers: Max Domi leads the Canadiens in goals, assists and points (25-39-64). Jack Eichel leads the Sabres (25-48-73), although he has just one assist in his last five games. Montreal is the only NHL team Eichel has not scored a goal against in his four seasons. ... Jeff Skinner has 37 goals but his slump has reached one goal in 16 games. ... The Sabres are 12-9 after regulation (7-6 in OT, 5-3 in shootout) and the 12 wins are second in the NHL, one behind Tampa Bay. ... The Sabres are 2-7-1 in March.